I profess that I have been a bit of a book snob lately. I am reading 50 books in my 10 weeks of summer; 20 of which should have a focus on social justice, and 15 of which should be by or about Asian Americans. The more these categories overlap, the greedier I become. I have been desperately craving something for me, something that helps me navigate everything this world has become with the body I have. Like author Michelle Kuo, I have been gripped by the powerful eloquence of writers who have “inherited a history of passions and resentments.” I want a Ta-Nehisi Coates to myself. A Toni Morrison. Someone who has resisted the convenience and violence of complacency and emerged a resounding rhetorician. But I need, at my core, someone who looks like me. I found all this in Reading with Patrick. Nothing has come close to the paralyzing and breathtaking truths of Kuo’s memoir. Though definitely accessible by all, this is a book that uniquely affects us as Taiwanese or Asian Americans, sharpening our clumsy dialogue around the Asian American relationship with the black community. For everyone else, this is an inspirational story about literacy as a form of resistance; about the power of educators; a critique of systemic and institutional racism. For us, Reading with Patrick is this and more. It is equal parts an affirmation that we belong in the conversation and a reminder of our own privileges: our ability to leave, to play both sides, to have been both broken body and parasite. Kuo gets our hesitant neutrality, our imperative to be both filial and civic. With that, I am honored and thrilled to interview Kuo. Leona: So the book just came out! People are actually holding it in their hands and about to learn some pretty vulnerable stuff about you. How are you feeling? Michelle: A little exposed, for sure. Part of the book interrogates ways in which I fall short, and convictions I have that I don’t live up to. When a person leaves a rural area, as I did, she re-enacts the very problem that rural areas face—de-population and exodus. The book places our people within the rural Delta, which is majority black, and explores what it means to be immigrants—by definition, people who exercise the option to leave. I’m hopeful that the book creates awareness of the Arkansas Delta, a place that is forgotten in national narratives, and offers an approach that is humble about the worlds many don’t know. L: You write about black role models – Maya Angelou, James Baldwin, Malcolm X. Your book begins with a Morrison battle cry. “Each of these people,” you say, “seemed as fearless to me as Asian Americans seemed afraid, as essential to American history as we were irrelevant.” How has the invisibility, the silencing of our own people affected your writing? How has it given or shaped your purpose? M: There were few visible East Asian Americans who looked like me when I was growing up—so few that I can name them with one hand: Michael Chang, Connie Chung, Kristi Yamaguchi. And, The Joy Luck Club. But when I was a kid, I didn’t think too hard about being reflected in literature. The truth is that if you’re a sensitive reader, you will find yourself in just about any text. And that is something extraordinary to think about. I wonder: maybe this is what it means to be an Asian American reader in the 80s and 90s. The lack of stories about our experience forced us to be more interior, searching, and generous. We imagined ourselves into the worlds of others, finding our hatreds and loves in all races and in all time periods. We forged our own canon. More recently I’ve wondered if our invisibility as Asian Americans is a freedom in addition to a handicap. Part of my teaching failure, as I explore in my book, is how I tried to force-feed “classic” African American texts that I loved to my students, who were all African American. Not all of them liked Malcolm’s autobiography or Baldwin’s short story or Obama’s speech, or believed that these men represented them. What a classic—and idiotic—mistake. I watched some of my students confront the impossible expectations that canonical black literature is sometimes imbued with. That they appreciate sacrifices of their forbears. That they live up to those sacrifices. That they look at people in humiliating situations and “learn” from them. Or people in heroic situations and imitate them. The Delta is one of the poorest places in the country, and its challenges and triumphs are rarely portrayed in mainstream narratives. Why would they see themselves, necessarily, in the canonical stories, or believe that the stories alone would transform their circumstances? Having said that, nothing can replace the experience of being reflected back racially. Many of my students devoured YA literature about black teenagers by writers like Sharon Flake, Sharon Draper, Jacqueline Woodson, Nikki Grimes. And I myself have been thrilled to hear from Asian American readers, who tell me that Reading with Patrick is the first time they’ve felt somebody has captured their experiences of having hard conversations with immigrant parents about their own choices. L: There is a chilling moment at the beginning of your book when you pass around a picture of a lynching to your students, expecting to elicit something visceral that could be channeled into something tangible. Yet you realize, quickly, that while you’d “meant to be daring and transgressive in bringing up the history of violence against black people,” you’d forced upon some of them immediate pain. But your intentions speak to a larger conviction that we have to know our stories, our histories. We need context for our ambition. You write in this Lithub essay that immigrant parents, particularly Taiwanese immigrant parents, “nurture aggression against them as an act of love.” That we, too, are protected from, rather than explicitly denied, our own stories and histories. How, then, can we navigate our “minority within a minority” identities as Taiwanese Americans? M: This is a hard and important question. My parents didn’t tell me any stories of democratic activists in the 1980s being killed or disappearing. They didn’t tell me about the February 28th massacre. When I bring these stories up, there’s no moment of shared grief or solidarity. Instead, they say that I’m too “innocent,” meaning I fail to recognize that these stories are politically motivated by a Democratic Progressive Party trying to shore up support. They don’t realize that they have nostalgia for an authoritarian state that an effective authoritarian state produces—through silencing of dissidents, through enforced national identity. And they left before Taiwan democratized, so they didn’t experience its tremendous social changes. In short, there are Taiwanese Americans like me who grew up without knowing basic facts about Taiwanese history. Making matters worse, most Americans don’t know much about Taiwan. What happens when you grow up without stories, without a sense of your own history? For me, I think the absence of context made me more eager to show I belonged, and totally unconfident that I brought anything to the table. Teaching in an African American community and doing legal aid for Mexican immigrants, I wanted to show solidarity. But I think I also unconsciously felt that these communities were somehow more American than my own. 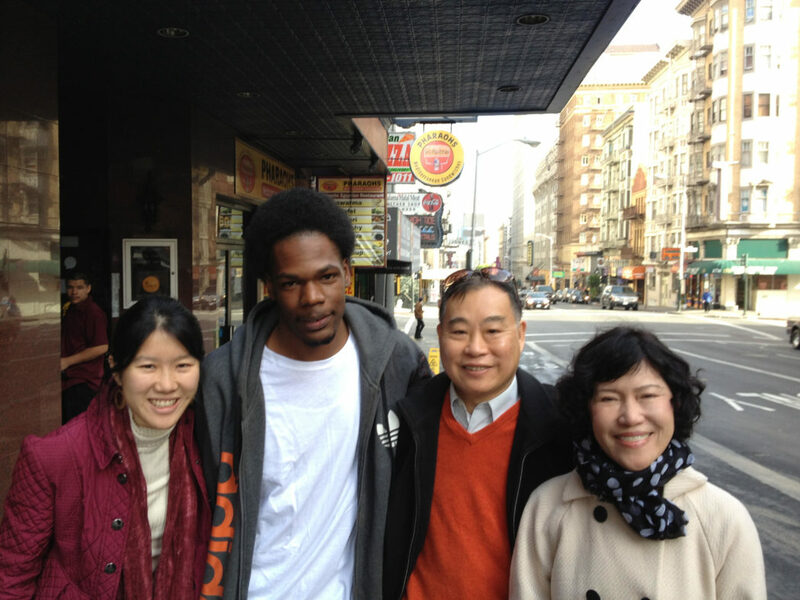 As I grow older, I’ve become more loving and open towards Asian American communities. I’m glad you brought up the uncomfortable scene in the book, even though it still stings. I understand now what I was trying to do in that moment: spark black nationalism through teaching the history of violence against African Americans in the Arkansas Delta. More lynchings occurred in the Delta than anywhere else in the US, and that history was suppressed until very recently. But I was wrong in how I approached it. In both Taiwan and in Arkansas, and indeed anywhere, people have emotional and difficult reactions to the memory of violence, and bringing up that memory with a political agenda tends to close rather than open conversation. Which brings me back to my parents: they’re not wrong to be cautious about the uncovered histories of violence in Taiwan. The memory of violence has always had a dangerous relationship with nationalism. Politicians of all stripes selectively use the past to inflame tensions. Gandhi once said that a happy nation is one that has no memory. He doesn’t mean history should be erased, but that, as the political philosopher Wendy Brown also argues, a democracy blooms when people create alliances based on shared goals rather than shared wounds. So I have to ask: in the tradition of your influencers – extremists and activists – you have chosen the “irrational measures,” dropping pre-med to study social studies and gender studies. What advice do you have for students and young adults who need the courage to do the same? M: I love your sensitivity and vulnerability here. My immediate reaction to this question—which is very Taiwanese American!—is that I’m afraid that if I say too much, their parents will be mad, call my parents, and then I’ll get in trouble. And I’m, like, 35. My feeling is that to find courage, we have to look in places beyond our parents. In mentors, in friends, in stories, in ourselves. This doesn’t mean that our parents won’t be intensely proud later on. And it doesn’t mean that they are wrong: I have many friends in “traditional” paths who are fulfilled, and who made their careers their own. Even though parents might not offer courage to do something different, they did give us courage to prove ourselves in an environment where we were minorities. As I grow older, I feel more appreciation that they suppressed their personal desires—there is something selfless about that. Still, I’ve learned that the best way to change their mind is simply to live the life that I want. They can’t really argue with me if I seem fulfilled. L: Some of our readers and contributors are writers themselves; many of them, like you, struggle to reconcile a creative passion with the expectations of parents who, at the end of the day, just want a kid who won’t starve to death and is easy to brag about (and/or marry off). What would you tell their parents? How have you navigated this with your own parents? Tell them that it takes time for a person to figure out his or her gifts. Everybody has a different path. There’s a Chinese proverb for this, too, that every person has a piece of his own sky. Nobody can predict the trends—previously “safe” careers are no longer safe. When I was growing up, many Taiwanese parents pushed their kids to do electrical engineering and focus on hardware. But these jobs aren’t the best anymore. Younger people have a better pulse on what’s going to be important. The economy is changing all the time, and useful skills change. Can they really be sure that they know what’s best? Trust that your relationship can change over time, and know where they’re coming from. This is what my Lithub essay was about. I’ve come to feel great compassion that I lacked when I was a dumb teenager and college kid. Being a Taiwanese immigrant means, well, coming from Taiwan. And until around two decades ago, Taiwan was a developing country where science and engineering at the top of a hierarchy, and humanities at the bottom. Until very recently the Taiwanese education system was like this: you take a single test in the twelfth grade, and if you do good, you’re considered smart and you get to go to college for engineering or become a doctor. If you do bad, you’re considered dumb and you go and study humanities, or nothing at all. And your names are published in the order of your score. (The joke was that if you were a “bad” student, you read the list starting from the bottom.) And, of course, how you do on the test is often shaped by your resources and whether you lived in urban or rural areas. This can be traumatizing for some. Try to ask them questions. What would have been their dream paths? My dad remembered that when he was kid, he wanted to be a “newspaper man”—but his father told him that was a dangerous profession. My mom remembered she wanted to write detective stories—but nobody pursued that in a developing economy. It helps to get them reflecting about their own context as fleeting and specific. They might realize that they didn’t grow up with professions as artists, activists, journalists, or service-oriented workers as viable possibilities. L: You put so much heart and thoughtfulness into your students’ curriculum, giving them books that affirm their identities and experiences. Selfishly, I’ll ask: what books, aside from your own, do you recommend for Asian Americans who need to feel like they belong? M: My husband’s a historian and I did legal aid for undocumented immigrants, so maybe it’s natural that I would choose a history of how the legal category of illegal immigrant was made. If you’ve ever felt that Asian America is not a formative part of American identity, you’ll change your mind reading Mai Ngai’s Impossible Subjects. Chinese exclusion was the “means by which the nation defined itself.” The heart of federal power to punish immigrants today, and classify them as illegal, originates with that racism. The story isn’t just about Asian America, either. Reading about the regulation of Asians alongside Irish, Italians, Mexicans—people whom I unconsciously embrace as being “more” American than Asians—helps me realize how Asians have been a part of American history. As for writers, there are so many Asian American writers I love. But in nonfiction, I love Wesley Yang, who captures the estrangement of Asian American men, and Hua Hsu, who has wonderful wide-ranging essays on Taiwan, race, and music. In the social hierarchy of cool, the Asian American man ranks the lowest, generally regarded as the least attractive, least worth talking to, least interesting. And Yang conveys the feeling of alienation brutally. Reading him, I felt myself admitting that I’d kept my distance well into my twenties, failing to embrace men who look like our brothers and fathers. And when I was thirty, I fell in love with a Taiwanese American guy, now my husband, and realized how hard I had tried not to date East Asian guy. It made me squirm. I’m also hopeful that, thanks to television, the disregard for Asian men is finally, incredibly, starting to change, with Master of None, Crazy Ex Girlfriend, Fresh Off the Boat. (Plus, there’s a funny scene in Broad City where Ilana Glazer is checking out an Asian guy.) And I’m hoping that as a younger generation of people come up and hear me complaining about how hard Asian men have it, they will have no idea what I am talking about. L: So the book is being translated to Mandarin and will be available in Taiwan in December! For those who grew up in Taiwan and have little personal experience with the black/white dichotomy of the United States, what do you think they will get out of Reading with Patrick? M: I am so thrilled about the book coming out in Taiwan. My husband grew up there from ages 5 to 18, and most of his family still lives there. So it is very personal to me that people will be able to read it in Mandarin. And the translator is wonderful—he translated My Father’s Paradise, among other works. I’ve had terrific conversations with my Taiwanese editor, who’s part of a younger generation in Taiwan that totally inspires me. Young people flooded the streets during the Sunflower Movement, mobilizing half a million people. Young people are fighting for conditions of homeless people, disability rights, and foreign workers. And young people are the big reason why Taiwan legalized gay marriage—the first country in Asia to do so. 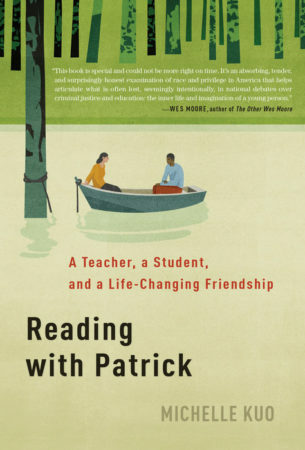 We’re hopeful that this generation, progressive and socially conscious, will deeply connect with Reading with Patrick, prompting them to be reflective about their power and limits. I think Taiwanese readers will also identify with the rural-urban divide: just as in the United States, rural areas suffer from a brain drain. People with means and education don’t come back. Teach for Taiwan, a new organization, sends students to rural areas, especially with indigenous populations, which experience similar challenges as Native Americans in the United States. And there is broadly a group of young people who want to use their education to create equality and social change. I focus on East Asians because it wasn’t until college that I realized that East Asian and other Asians were placed in the same category of “Asian American”. Amazon, Barnes & Noble, Powell’s, Target, and other book retailers.